Emy, Random Acts Executive Director Rachel Miner and Holli at the Random Acts booth. 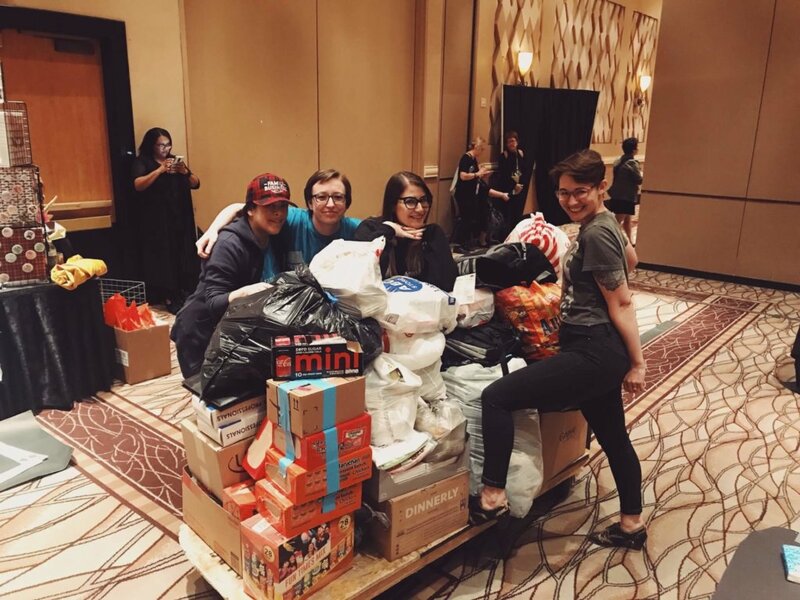 We celebrated, we partied, but mostly we #gotkind for youth experiencing homelessness in Nevada at the Supernatural convention in Vegas. With the recent announcement of the upcoming end of the Supernatural television series, it was expected to be a bit of a somber weekend. While a few tears were shed, the bigger theme of the weekend was “found family”. And no fandom knows how to #getkind better than the Supernatural family. Emy, Holli, Fundraising Officer Iliana Habib and Writing Manager Becky Houseman with the donations for NPHY. Jason Manns helped us get the donations out of the Rio. 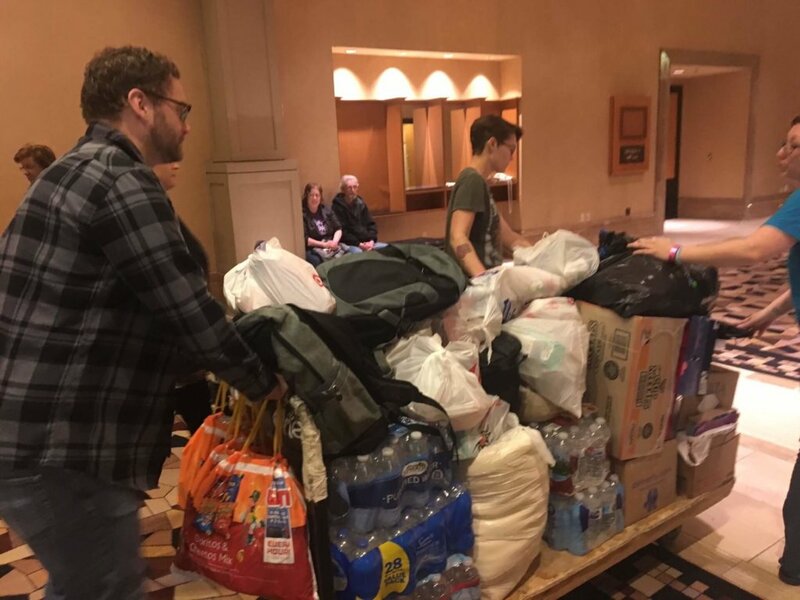 The Vegas #SPNFamily also brought many items such as non-perishable food and clothing items to donate. As you can see from the pictures, we ran out of room and spilled into the walkways with your kindness! In total over 2000 items were donated for Nevada Partnerships for Homeless Youth. We loaded up the cart with items, but it was a bit too heavy for Holli and I to push ourselves! Luckily, we solicited the help of a friend of Random Acts, Jason Manns. (You can check out some of the other ways Jason has helped out Random Acts over the years here!) With the help of NPHY and some kind passerby’s, we were able to Tetris their SUV and get it all loaded up! 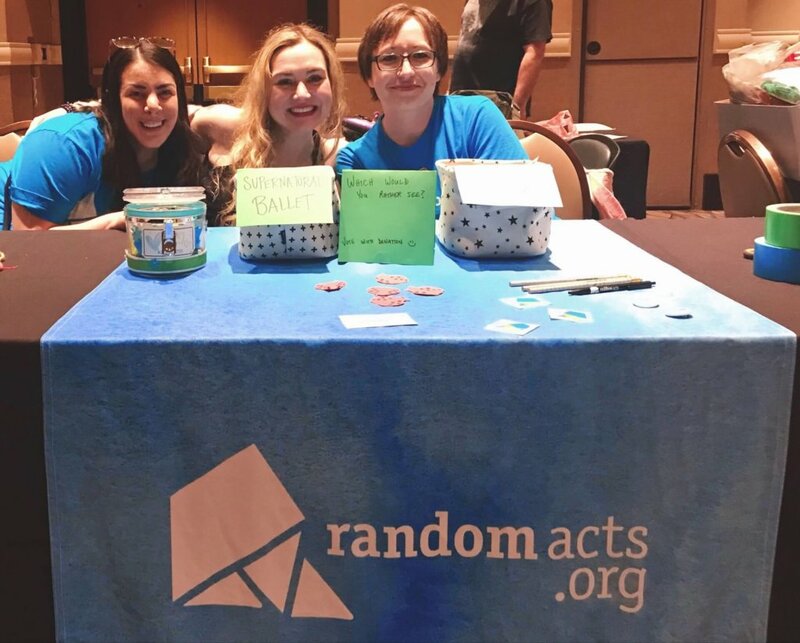 Random Acts partners with a different local organization at each Supernatural convention to help them raise funds or donations. Check out our news page to see when we will be coming to a town near you!